TALLAHASSEE, Fla. — Retiring the first 15 batters she faced, Kylee Hanson had another dominant day in the circle as No. 6 Florida State (50-10) defeated Jacksonville State (35-25) by a score of 10-0 on Sunday afternoon at JoAnne Graf Field to win the 2018 NCAA Tallahassee Regional. Hanson had not allowed a hit and recorded 23 strikeouts in her first 10.0 innings against Jacksonville State during the regional, and had a perfect game going on Sunday until Hayley Sims hit a double to left center to start the bottom of the sixth inning. The redshirt senior finished with 11 strikeouts in 6.0 innings, allowing one hit and retiring 18 of the 19 batters she faced to improve to 27-4 on the season. It was Hanson’s second streak of 10.0 innings without allowing a hit this season as she recorded 10.2 hitless innings in games at Notre Dame (April 29) and at NC State (May 5). The Seminoles advance to the NCAA Super Regional round for the seventh time in program history and the sixth time in a row. FSU will be a host school for the third year in arrow and will welcome the winner of the Baton Rouge Regional – either No. 11 LSU or No. 22 Louisiana – on May 24-27. Specific dates and game times will be determined following the completion of all NCAA Regionals. “First of all, congrats to Jacksonville State on an amazing year,” said FSU head coach Lonni Alameda. “The games they played yesterday were with such passion and heart and that comes from the top down. Their coach is a good character coach and has a really cool program. So it was great to play against a team like that. The Seminoles broke out for five runs in the top of the third inning to take a 5-0 lead. Jessie Warren led off with a double to right center and walks to Carsyn Gordon and Sydney Sherrill loaded the bases with nobody out. Back-to-back sacrifice flies to right field by Anna Shelnutt and Dani Morgan opened the scoring for the Noles. The inning continued on an RBI infield single by Cali Harrod and Cassidy Davis followed with a two-run single to left field to put FSU up 5-0. Warren led off the FSU fourth inning with a single to left center and was pinch-run for by Deja Bush. Bush stole second, moved to third on a JSU error and Gordon followed with her third walk of the game. 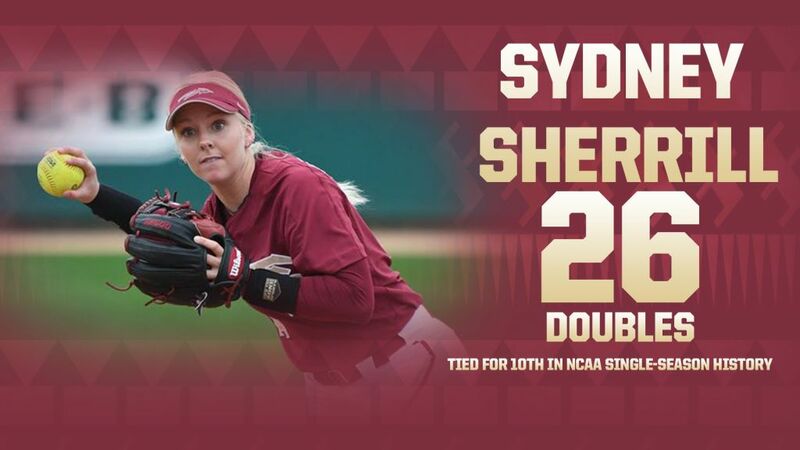 Sherrill lined a double to right to score Bush and extend the FSU lead to 6-0. It marked her 26th double of the season, which leads the NCAA, is tied for third in ACC history and 10th most in NCAA single-season history. Shelnutt was hit by a pitch to load the bases and Zoe Casas lined an RBI single to right field to push the Seminole advantage to 7-0. Florida State added three more in the top of the seventh inning for the 10-0 final score. Gordon drew her fourth walk, setting a career high, and scored on Sherrill’s 10th home run of the season, a two-run HR to center. Shelnutt was hit by a pitch for the second time and came around to score on an RBI double off the wall in left by Casas, her seventh multi-RBI game of the season. Davis allowed one hit in her inning of relief to close out the game in the bottom of the seventh. Florida State will host the winner of the Baton Rouge Regional, as No. 11 LSU and Louisiana are playing in the regional final later this afternoon. Specific game days, times and ticket information will be determined once all 16 NCAA regionals have completed. The Seminoles are hosting the NCAA Super Regional round for the third consecutive year.